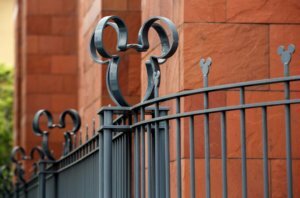 The Walt Disney Co. Mickey Mouse logo on a fence at the company’s studios in Burbank, Calif., on May 9, 2016. MUST CREDIT: Bloomberg photo by Patrick T. Fallon. Walt Disney Co. will show off its highly anticipated Disney+ streaming service at an April 11 investor meeting, providing a peek at a platform that will challenge Netflix Inc. head on. The service, which will include original movies and TV shows from Disney’s Marvel, Pixar and other brands, is scheduled to debut later this year. It will be a third, more family-focused streaming service, on top of Disney’s existing ESPN+ and Hulu, which will soon be majority owned by the Burbank, California-based entertainment giant. Among traditional media companies, Disney is making the biggest bet on streaming and monthly subscriptions. The company will soon complete the $71 billion purchase of 21st Century Fox Inc.’s entertainment assets, which will bring in more film and TV franchises it can exploit in theaters, on TV and online. After that deal was announced in late 2017, Disney reorganized its business to create a standalone direct-to-consumer division for streaming. In a filing Friday, the company provided details on how that business and all of the company’s divisions would have looked under the new structure for the past three years. Disney’s direct-to-consumer division, for example, lost $738 million on revenue of $3.4 billion for the fiscal year that ended Sept. 29. Those numbers reflect Disney’s investment in new content and technology, without the full benefit of subscription revenue from the new streaming service still in development and ESPN+, which was introduced in April.